Drekka who is Mkl Anderson met remst8 while performing at the Electro-Music Festival in Indianapolis in 2017 and was mesmerized by remst8's performance of glacial ambience and field recordings. For this split single each artist swapped source material reworking the other's raw sounds into new forms. 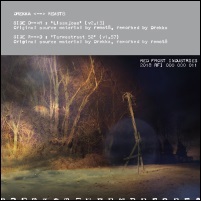 Drekka reworked's remst8's 'Lissajous' from their 2017 album Accumulator which collected tracks recorded between 2014 and 2016 by the experimental musician. remst8, meanwhile, reworked 'Tarwestraat 52' the centrepiece track from Drekka's on-going trilogy of albums for Dais Records. Both artists are dealing with drones but they offer very different takes on the subtle sound shifts. The drone which underpins 'Tarwestraat 52' sounds like a stretched piano chord. Although minimal, remst8 fills the entire track with miniscule detail from the other sound elements like the tiny piano notes and the jagged electronic tones that are textured and screechy. Everything on 'Tarwestraat 52' is blurred and distant, unhurried and slightly out of focus. While 'Tarwestraat 52' mixes sound processing with an elongated drone, the drones of 'Lissajous' are merged with environmental sounds recorded outside of Drekka's studio. 'Lissajous' opens to sound shifts and found sound in the form of insect chirps, which could be either cicadas or crickets. The effect is of imbuing the track with a sense of late evening or nocturnal activity. Drones swirl and shimmer, with an ominous and quiet understated uneasiness. At points there's a rush of sound like the engine of a lorry or train piercing the night air as it passes by before it settles back into queasy unsettling drone eeriness.